“Now what starts with the letter C? I put out a poll on twitter to see whether I should make chocolate or vanilla cookie dough ice cream. Personally, it was a no brainer – chocolate! Much to my chagrin, I was utterly outvoted. The Husband lobbied heavily for vanilla because its his favorite ice cream flavor. Insane, I know. So, rather than moping around about the loss of a chocolate ice cream base, I decided to get myself excited for making vanilla bean ice cream, even though it was slightly against my own wishes. First things first. I needed good vanilla bean yet I did not want to spend crazy amounts of money. So, I decided to buy vanilla bean paste , which, for $11 is a much more reasonable approach. (1 tbs = 1 vanilla bean). Done. Next I needed pasteurized eggs. Because the cookie dough bits inside the ice cream are raw, I had to be careful not to poison anyone with salmonella. I scoured the internet to try and find places that sell pasteurized eggs. They’ll be marked with a little ‘P’ noted every website. So, I set on my way. Fail. I went to four stores and no one sold pasteurized eggs. The dairy man at Whole Foods told me the closest they had was “pasture-raised” eggs. Totally different I informed him. Duh. So, I had to settle on Nulaid Reddi-Egg product. I was slightly concerned that it would ruin the consistency of the cookies, since it was essentially egg whites (and coloring to make yolks) so I made the dairy man promise me that if my ice cream or cookies were bad (after his sampling!) he would let me return it. Now that’s customer service. Armed wit these two key ingredients I went on my merry way to make the ice cream. There are two main components to this recipe: the vanilla bean ice cream and the cookie dough. You’ll have so much cookie dough left over that it makes sense to make cookies with it, and garnish each serving of ice cream with a home-made cookie. Trust me, the presentation is beautiful! 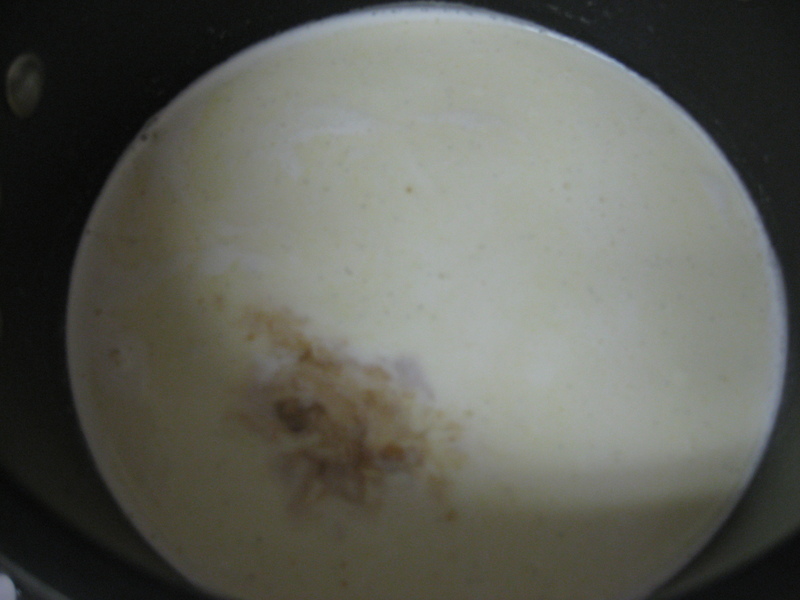 Melt the sugar, vanilla bean, two cups of whole milk and pinch of salt on the stove top. Do not boil. Once the sugar is completely dissolved add the cup of heavy cream and vanilla extract. The mixture should be a very light khaki color and dotted with black (from the vanilla bean). Cool entirely in the refrigerator, at least four hours or overnight. Mix the flours, baking soda and salt in a bowl and set aside. 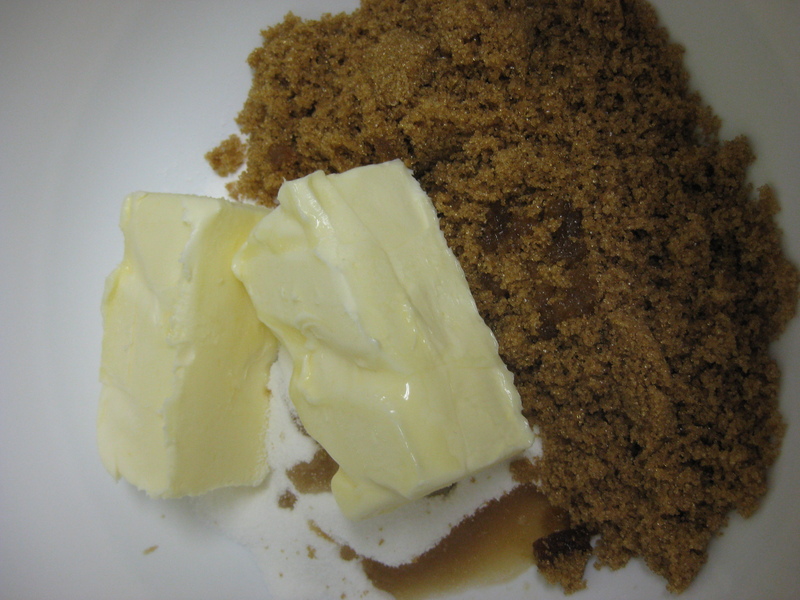 Beat the butter, white sugar, brown sugar and vanilla together. Slowly add in the eggs one at a time. Next add in the flour until the dough forms. Make sure to mix it all well and that there are no clumps of flour or butter. After making the dough it’s important to chill it in the refrigerator. This makes it easier to roll into a log (for cookie dough bits in the ice cream) and into small circles to make the cookies. 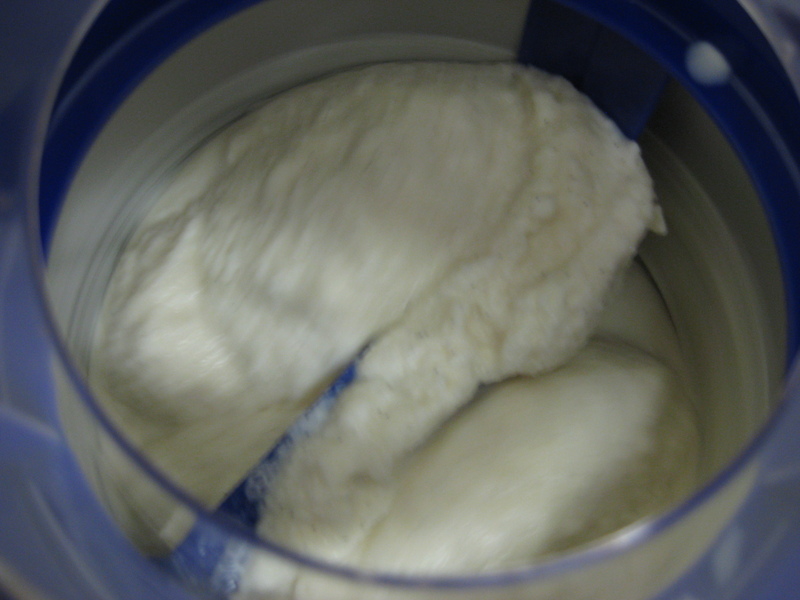 Vanilla bean ice cream churning. 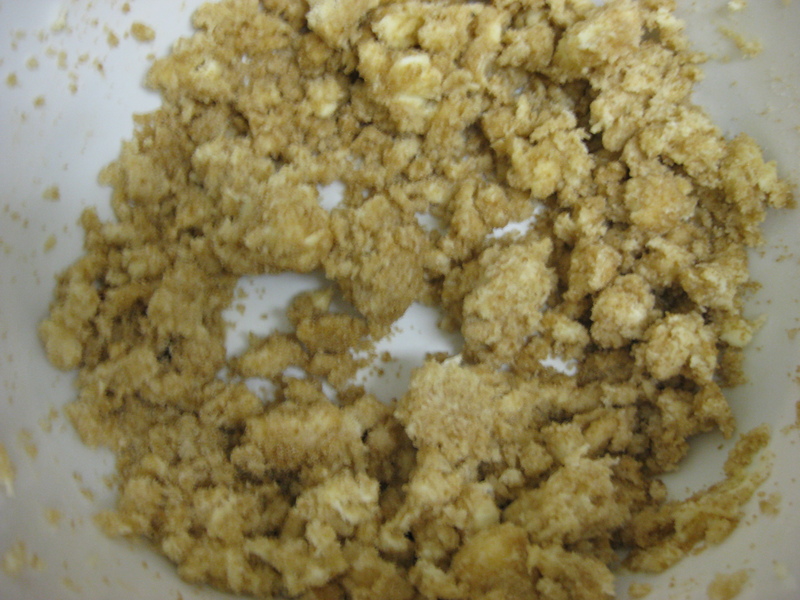 Add the vanilla bean mixture into the ice cream maker and process according to the manufacturer’s instructions. For me, this ice cream churned for 20 minutes. I’m convinced that this recipe would have yielded a lot more ice cream if I had not been eating so much of it out of the container. Truth be told, this one was irresistible! While the ice cream was churning, I formed approximately 6-8 cookie dough logs (each one approximately 3 inches long and 1/2 inch wide). I broke little pieces off of the cookie dough logs and used this to layer and marble the vanilla bean ice cream with cookie dough. This part is not an exact science at all! Remember, you want to add as much or as little cookie dough to this ice cream as you wish. Once the ice cream is done churning (and you’ve tasted a sufficient amount of it!) start by putting 2 scoops of ice cream into the bottom of the storage container. 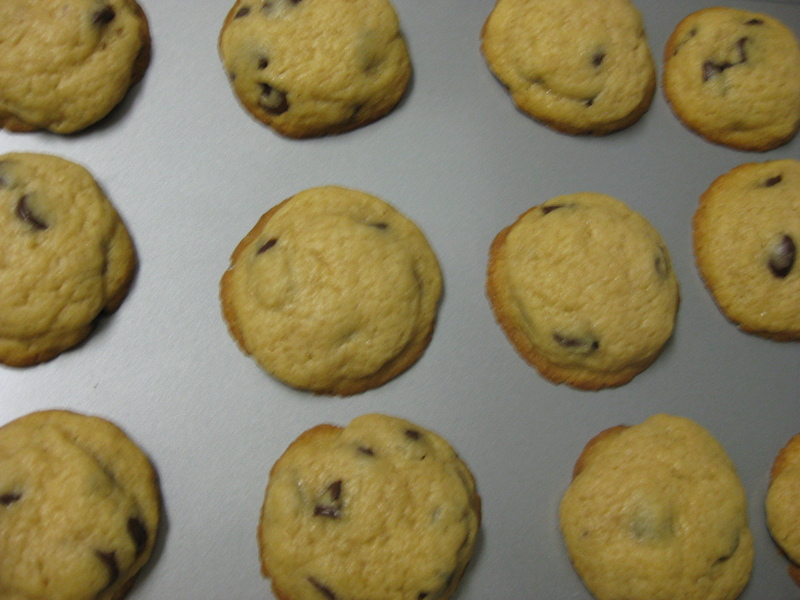 Layer it with miniature balls of cookie dough (broken off the aforementioned cookie dough balls). Continue this process until you are done layering the ice cream and adding cookie dough. When you are done, take a knife and randomly stick it into the ice cream. When you make a little hole, add another few cookie dough balls, for good measure! Repeat this a few times and you’re done. I was on the phone with my sister when this ice cream was churning. 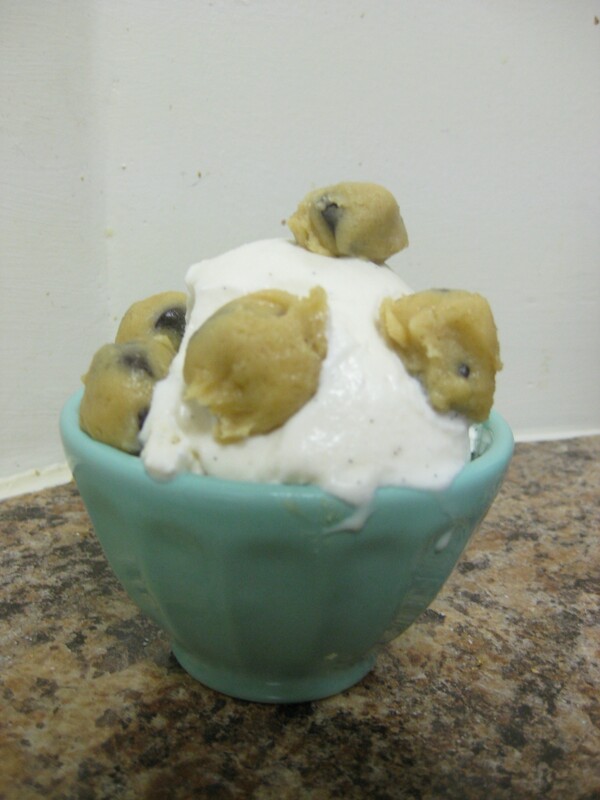 Suddenly it was ready and I realized that I needed to layer the cookie dough and mix it within the ice cream. “I am layering the cookie dough ice cream and I need to call you back, ” I said to my sister in a hurried voice. She burst out laughing and suddenly made it her facebook status. I didn’t think it was so weird, but apparently she thought it was funny! At least her facebook status drove traffic to 365 scoops! The Husband said it was his favorite flavor yet (his eyes were bugging out of his head with excitement). I had a little leftover chocolate ganache that I reheated and drizzled over the top which was a really nice addition. Enjoy! I can’t believe I missed the choco chip cookie dough ice cream!!! The office freezer is empty… it wants to be filled with ice cream.